I doubt that Mozart requires much explanation on my part. It would be like introducing a play by explaining who Shakespeare was. We know Mozart was a child prodigy. He had a prodigious general output of symphonies, operas, and other genres. Mozart wrote over forty concertos, and established that genre as comparable in importance with the symphony. he was lucky to have close friends who were virtuosi on those instruments which Mozart hadn't mastered, and indulgent patrons who were very knowledgeable of instrumental music. He wrote only five authenticated concertos for violin, and did so within a period of two years. He was only nineteen years old. He had been taught to play the violin by his father and had performed publicly with it as a child, but he didn't appear to be very interested in that form for most of his life. This group was thought to have been written either for his own performance or for that of a friend, and they don't show the same musical complexity as many of his other compositions of the same period. At least, that is the view of some musical authorities. Of all the five violin concertos, the fifth one, which we are to hear today, is considered to be the finest of all. It is certainly the most often played. The work is in three movements, as is customary for concertos, especially at that period. The first movement is Allegro aperto, but after the orchestral opening, the soloist enters with a six bar adagio. The second movement is Adagio, offering no further surprises. The final movement, Rondeau, tempo di menuetto is subtitled alla turca which offers a decidedly "alien" quality of Turkish drama in a minor key. Here, the cellos and basses are instructed to use the wooden part of the bow instead of the strings. That is referred to a col legno, pronounced "col LENyo." A concerto is a sort of competition between the solo instrument and the orchestra. Typically, there is a place in one or more of the three movements when the orchestra stops playing, and allows the soloist to show off. That is called the cadenza (plural, cadenze). In early concertos, such as this one, the performer was expected to invent his or her own cadenze. As time went on, that became burdensome to some performers and intimidating to others, so it became common to use a cadenza written by someone else. In later times, a composer might provide several cadenze from which the performer could choose. In this performance, the composer of the cadenze is Joseph Joachim. I have heard people say that, yes, they like "classical music." When pressed to specify, they say, "I like the Clair de Lune, the Moonlight Sonata, and The Fifth Symphony." It turns out that they know only those pieces, and it doesn't occur to them to wonder which "fifth symphony." 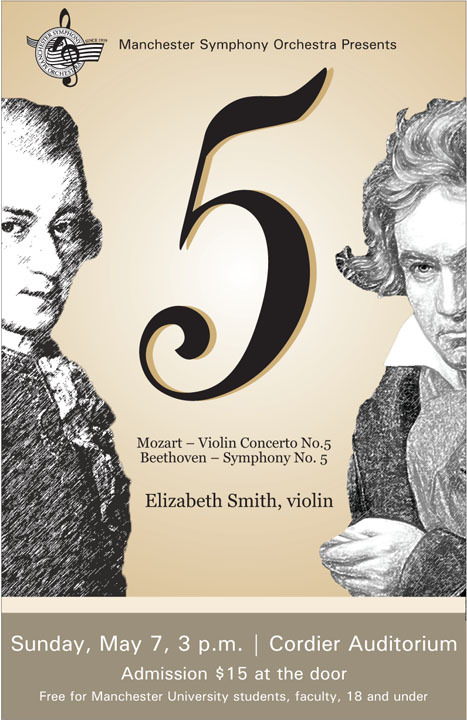 There are probably hundreds of "fifth symphonies," but we all know to which one they are referring: Beethoven's Fifth! This may be the world's most famous symphony, and we are so used to it, we often don't bother to add the name of the composer. That dramatic opening -- ta-ta-ta-TAAH -- has become part of our culture. It is ironic that in the Second World War, this German music was used by the British as a symbol of the confidence they had in their eventual victory over the Germans (the rhythm of the opening corresponds to the Morse code symbol for the letter V for "victory"). The whole first movement is based on those opening notes. There is more there, of course, but we notice their occasional absences more than anything else. In fact, throughout the other movements there is a repetition of the same rhythm. That so much can be derived from such a simple sequence speaks volumes for Beethoven's inventive powers. In the second movement, the same rhythm which appeared "fateful" in the first movement seems almost sweet. The variations on the theme in this movement alternate between sweet and dramatic. Musicologist Tovey describes it as "smiling through tears." As the movement comes to an end, we expect the soft tones to drift to silence, but instead, the music swells to a triumphant end. The third movement of a "classical" symphony, as developed by Mozart and Haydn, was expected to be a rather sedate minuet and trio; that is, a stately dance played twice with a contrasting part between (originally played by three instruments, hence "trio"). Beethoven changed the character of the symphony by introducing the scherzo as a substitute for the minuet. Initially they were in a similar rhythm, but a different tempo. Haydn had introduced the scherzo in some of his works, but reverted to the minuet. "Scherzo" means "joke," but that shouldn't be taken literally. It usually means "light" or "sprightly," and as time went on, Beethoven's scherzi got faster and faster. Here, the movement begins softly, and with a march-like determination, sounding not the least bit humorous, but then it changes to a fugal section, which DOES sound rather sprightly, with the music suggesting growing confidence. Then there is a return to what some call a "spooky" quality before the march returns, this time softly in the woodwinds. Next, something surprising happens. The scherzo becomes quieter and quieter, supported by a soft drum-beat, and just as we are wondering when it will come to a quiet close, there is a tremendous crescendo, and the final movement begins ... without the usual pause between movements. If that weren't enough of a shock, we have the outburst of the trombones, piccolo, and double bassoon ... the first time they ever appeared in a symphony. Romanticism is on its way, and Wagner would not fail to notice the trombones! When it was over, Berlioz found him in the corridor, "striding along with a flushed face." Lesueur replied, "Ouf! Let me get out, I must have some air. It's amazing! Wonderful! I was so moved and so disturbed that when I emerged from the box and attempted to put on my hat, I couldn't find my head!" The next day when they met, Lesueur admitted that he had been deeply moved, but shook his head and remarked, "All the same, music like that ought not to be written." "Don't worry, Master," Berlioz replied, "there is not much danger of that." Elizabeth was born in Northampton, England. She gained her Bachelor's and Master's degrees in music from the University of York. She also gained a PGCE in music education from the University of Cambridge. She played the violin in both university orchestras, serving as concertmaster whilst at York. She also played in Baroque and Contemporary music ensembles.